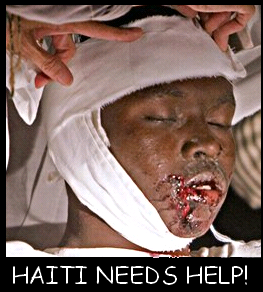 You have seen the devastation of Haiti on TV. Now please switch on to their needs. The UNITED SIKHS team , headed by Lt Col Gurbachan Singh and 4 volunteers including doctors, has arrived in Haiti through the neighbouring islands. They have found that looting and devastation is painful to describe. They have set up a base camp and and wish to set up a langgar service (hot community meal) and distribute food and medical supplies urgently. See the UNITED SIKHS appeal poster attached . Please put it up an your local Gurdwara or community centre. If you can volunteer in Haiti please Join UNITED SIKHS at http://www.facebook.com/l/f68de;www.untedsikhs.org/join and you will receive an automatic email acknowledgment with a link to a health history form and a volunteer application form for field projects. Kindly fill both forms and email them to volunteer@unitedsikhs.org asap. We also urge you to put up the attached poster at your workplace and gurdwara and help in fundraising this Sunday . Take the initiative to collect the donations and post them to us with the donors details so we may issue a receipt.